THIS tiny shop with the funny name may be tucked away behind a wall of ivy in the Starland District’s Desoto Row, but that hasn’t stopped Savannahians from bringing Maldoror’s into the spotlight for its second win in as many years. The custom frame and rare print gallery is owned and operated by Jenny Weldy and Andy Johnston, who met at the College of Charleston and bonded over a love for fine arts and creative crafts. “I’d always enjoyed hands-on work, so I started framing to do it for ourselves. Then we started doing it for friends,” says Weldy of her accidental foray into the professional matte and frame world. The couple moved back to Weldy’s hometown of Savannah and opened their cloistered spot in 2006. They’ve built a loyal customer base catering to budget-conscious SCAD students hanging their first shows, professional artists requiring an eye for detail and the Rangers of Hunter Army Air Field, who provide a regular stream of ceremonial plaques that need framing. Word of mouth has always been their primary marketing tool, and a 2007 mention in the New York Times continues to attract curiosity seekers. 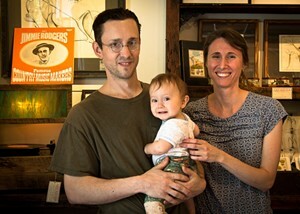 These days the artisans are joined in the shop by their one year-old daughter, Mathilda. Johnston confesses the shop is named after a beloved cat rather than the creepy poem by proto-surrealist Comte de Lautréamont, but Maldoror’s retains the eerie beauty of a Victorian sitting room with antique prints and the scent of freshly-milled wood. A fascinating collection of engravings and lithographs dating as far back as the 16th century hang on the walls, juxtaposing the beautiful and grotesque by design: “We try to keep a keen eye on points where those divisions overlap and merge,” proclaims the Maldoror’s website. When he’s not planing angles for others in the back room, Johnston creates marvelous turntables and lamps out of reclaimed heart pine under the name Ars Regia. Weldy and Johnston have watched Starland’s destination as an art nexus ebb and flow, and it might be argued that they’ve been an anchor all along. Going on nine years, they are Desoto Row’s longest current residents, and they don’t plan to change.